1. I replaced the 5.8 GHz clover leaf antenna on my FatShark goggles with a helical antenna (and learned to use my own head as an antenna tracker). 2. 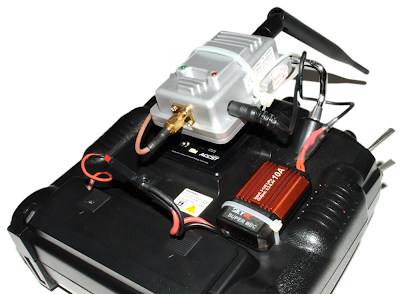 I boosted my 2.4 GHz radio control signal with a 2-Watt WiFi booster. I used this 7-turn Right Hand Circular Polarized (RHCP) helical antenna from BEVRC. It's cheap (only about $16) and has a 10 dB gain. 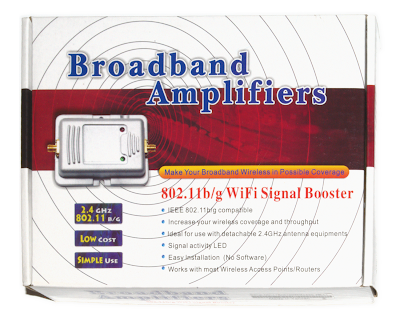 I found this works better than using a patch antenna because interference from reflected signal is less of a problem. 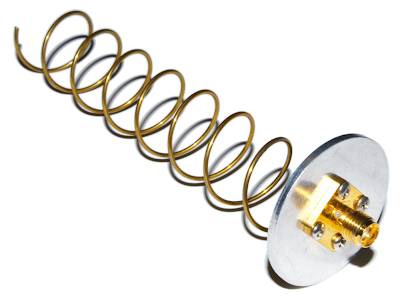 Make sure the direction of polarization matches that of the cloverleaf antenna on your aircraft. This antenna gives excellent range as long as I point it directly at the aircraft and it has line-of-sight. Reception through trees is still quite poor. It takes some practice to get used to pointing your head at the aircraft while flying FPV, but soon it becomes second nature. This cheap 2-Watt WiFi signal booster works with any 2.4 GHz radio, just connect it between tx module and antenna with the included coax cable. Starting September 28, 2013 and ending October 5, 2013 (23:59 PST), MavBot is running a Facebook Page Promotion 'Win a T-MOTOR 9*3 Carbon Fiber Prop Set for DJI Phantom' at http://bit.ly/1fS1BQn . This page contains this Promotion's Official Rules. This promotion is in no way sponsored, endorsed or administered by, or associated with, Facebook. Participants are providing information to MavBot and not to Facebook. The information provided will only be used for administering and communicating with participants about MavBot and the MavBot promotion they are participating in. T-MOTOR will soon introduce a set of four 9*3 antiGravity! Carbon Fiber Props for DJI Phantom. Have a go at being the first to fly a set of these revolutionary, all-white props with a retail value of $89.90, by entering MavBot's Sweepstakes today! The Sweepstakes entry period begins at 00:01 a.m. PST on September 28, 2013 and ends at 11:59 p.m. PST on October 5, 2013 (the "Sweepstakes Period"). Winners will be randomly selected within 24 hours, from entries properly submitted and timely received during the Sweepstakes Period. Prize: One T-MOTOR set of four, all white, 9*3 antiGravity! 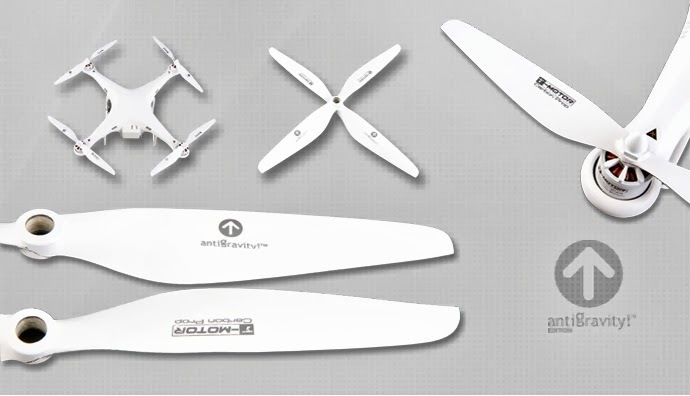 Carbon Fiber Props for DJI Phantom with a retail value of $89.90. Prize will be delivered free of charge to the participant's street address as submitted at registration for the Sweepstakes. Prize will not be replaced if lost or stolen, is not transferable and is not redeemable for cash. All taxes and other charges are responsibility of the winner. No substitutions are allowed. Prize is valid for redemption up till three (3) months after prize is drawn. If prize is not initially redeemed during this period then the prize shall be voided. All expenses not specifically mentioned herein are not included as part of any Prize package, and are solely the winner's responsibility. MavBot (Sponsor) Facebook Page Sweepstakes (the Sweepstakes) is open only to legal residents of the fifty (50) United States and the District of Columbia over the age of 18 with access to the Internet at all times during the Sweepstakes and subsequent prize-award period. All employees of MavBot, Lizara Freezone N.V. or its subsidiaries, all associated agencies and each of their respective affiliates, sales representatives, distributors, licensees or agents (all of the foregoing, together with Sponsor, collectively referred to as Sweepstakes Entities), and their immediate family members (spouse, parent, child, sibling and their respective spouses) and those living in the same household of each (whether related or not), are ineligible to participate in the Sweepstakes. All applicable federal, state and local laws and regulations apply. Void where prohibited or restricted by law. Entry in the Sweepstakes constitutes full and unconditional acceptance of these Official Rules. No purchase is necessary to participate in the Sweepstakes and a purchase will not improve the chances of winning. During the Sweepstakes Period, participant may submit an entry form online using the sweepstakes entry form located on MavBot's Facebook Sweepstakes tab. Limit one (1) online entry per email address. As a condition of entry into the Sweepstakes, except where prohibited by law, each entrant, and each winner by accepting a prize, grants to Sponsor and its affiliates, legal representatives, assigns and licensees, all right, title and interest in to publicize, broadcast, display and/or otherwise use the Sweepstakes entrants name, city, state, and biographical material (collectively, Licensed Rights) in any media now or hereafter known throughout the world in perpetuity for advertising and publicity purposes, without additional review, compensation, permission or approval of the winner. Where necessary, the winner will be required to execute and return an Affidavit of Eligibility/Liability and Publicity Release within five (5) business days of attempted notification or the winner may be disqualified and an alternate winner selected. The potential Prize winners will be selected in a random drawing. Winners will be selected from entries received during the Sweepstakes Period who have not yet won a prize. Odds of winning will depend on the number of eligible entries received during the Sweepstakes Period prior to each drawing. The potential winner will be notified via email to the email address submitted with the potential winners entry within three (3) days after the drawing. The drawing will be conducted by Sponsor, the judge of the Sweepstakes, whose decisions on all matters relating to the Sweepstakes shall be final and binding. In the event that a potential winner is disqualified for any reason, Sponsor may, in its sole discretion, award the applicable prize to an alternate winner selected at random. Any return of prize notification or prize email as undeliverable will result in forfeiture of any prize and an alternate winner may, at Sponsor's discretion, be randomly selected. Participants in the Sweepstakes agree to be bound by these Official Rules and the decisions of Sponsor. By accepting the prize, the winner agrees to release and hold MavBot, Lizara Freezone N.V. or its subsidiaries, all associated agencies and each of their respective affiliates, harmless from and against any and all losses, damages, rights, claims, actions and liabilities of any kind in connection with the Sweepstakes or receipt or redemption of the prize. The winner assumes all liability for any injury, death, or damage caused, or allegedly caused, by participating in the Sweepstakes or use or redemption of the prize. To obtain a copy of these Official Rules or for a list of the winners, send a self-addressed stamped envelope to Sponsor. Requests for winners' lists must be received within three months after the end of the Sweepstakes Period. MavBot / Lizara Freezone N.V., Frankrijkstraat 13, Oranjestad, Aruba. Mistake #1: Some of the hills around the flying area rose to at least 100 meters above the launch point, but I had the Return to Launch (RTL) minimum altitude set to only 50 meters above launch altitude. Note: I later realized that setting the RTL alt even higher wouldn't have helped anyway, because the current ArduCopter code foolishly limits RTL height to 80 meters). Mistake #2: I flew behind the hill at such a low altitude that the forest cover on one of the hill's ridges came between me and the vehicle, thus scrambling my video signal (the 5.8GHz video is so high frequency that even vegetation can scramble the signal quite easily; whereas my RC control on 2.4GHz remained solid through the entire ordeal). Mistake #3: Upon losing the video I did not back up or gain some altitude, but instead just kept going forward for a couple seconds, hoping video would come back. This just made the problem worse. To help prevent this kind of accident happening again, I made a change to my local ArduCopter code to make it so that RTL always climbs first before heading back to launch, no matter what altitude that RTL is invoked at (although my code does provide for an absolute altitude limit if the Fence feature is turned on). I've been using the code for a few weeks, and found that it makes FPV flying much safer, without having to set an inconveniently high RTL altitude; especially in high mountainous terrain or around tall trees. I submitted the code as the RTL Always Climb pull request to ArduCopter.